This is MARYSLIM's third attempt towards the rock and roll throne and they do it with passion fired by AC / DC madness. Their first two records are Maryslim and Split Vision and now they continue their travel to their dark world of rolling thunder. 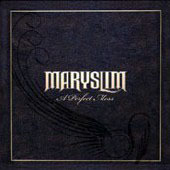 MARYSLIM seem to have their own sound. You can imagine a combination of hard & heavy rock and roll, accompanied by melodic choruses as well as some gothic elements. The band has been described as a splendid mix of mid-70/s hardrock and punk, with some sound additions of bands in the likes of CULT, AC / DC and more other interesting bands. Moreover you can find elements form bands like KISS, D.A.D., BACKYARD BABIES, MOTLEY CRUE and so on. Just only by taking into consideration the aforementioned bands you can have the picture of what you are about to listen to here. Just think of a mixture of fine rhythm melodic vocals from time to time, catchy choruse and generally a real cool atmosphere throughout the record. Maybe not all of their compositions are extremely unique, but on the whole the album flows very easily and offers a nice rocking relaxation. You will find yourself whistling some of their melodies throughout the day for sure if you like this kind of music and that is for sure. Sonically speaking the vocal lines are quite sympathetic with a melodic pop rock feeling while the guitar work is focussed in direct riffing and playing motives. One of the brightest and most extraordinary moments of this album is the participation of Jyrki69 from the band 69 EYES by performing the lead vocals on an extremely cool version of SISTERS OF MERCY/s This Corrosion as well as performing backing vocals in the song Alive . In addition this album was recorded in the famous Abyss Studio with producer Peter Tagtgren (PAIN, HYPOCRISY, DIMMU BORGIR) . Highlights of this album can be considered - amongst the other - the following ones: This Corrosion, A Perfect Mess , Final Warning and Demons Of The Past .